I don't understand, this product had /25 and /100 Cal auto's that were live in product from what I've been able to research... plus they were sticker auto's... why couldn't it have make pack out?!?!?!? Anyways, the redemption card, as is, is going to be shipped to William, hopefully he can badger/beg/threaten UD into some type of compromise or maybe even the card. I hope everyone enjoyed the break. The wife and I are working on sorting, packaging and getting the postage printed to get these out in the mail A.S.A.P! If you are even the least bit un-sure as to whether I have your address or not, please e-mail me samuelpair@yahoo.com so that I can get your package postage printed out. Thanks again for the massively quick sign ups and payments, it makes for a quick and happy break on my end for sure! What do you think about the products? 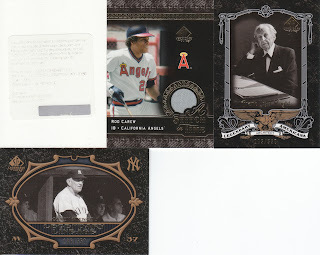 I'm REALLY considering doing Topps Unique again in a future break, I MIGHT do Co-Signers as I like the parallels but not a big fan of the boxing autos... and SP Legendary Cuts, it would be GREAT if the Cal auto was actually in there, so I may give it a stab again some time down the road... Let me know what you all think! Next month's break will be a bit delayed, as I'll be on vacation and unable to post, but no worries, I will get the sign-ups posted once I return! Yeah, they won't redeem that. Tried and failed with (now) two of my own. Their official line is that a) they can't (because of losing the license) and b) non-redeemed cards were never produced. Both are BS. Still a cool product though. As for the products overall, I'd agree with your assessment as well, and in that order. I'd recommend not doing anything that might have expired redemptions...just not worth it...I feel for the guy who should have got that Cal cut signature, what a bummer! Thanks for the break though, good fun all around I've been dying every day to see you update each box break! Did you randomize the Frank Lloyd Wright insert? Yes, I did and it went to David (Indians & Royals). As it wasn't a "hit" I just did the randomization myself and added to his stack. Also, since only two people were interested in the boxing expired redemption, I randomized that as well and it went to arpsmith (giants).